Monday July 20th, 2015, I had the privilege of ministering in Ruston, Louisiana. What made it special for me, is what happened the first time I went to Ruston. When I was about 21 years old, my car ran hot, and I had to stop to fix my radiator. My truck stalled and I coasted to the top of a hill, where there was a gas station. I asked the clerk where the anti-freeze was, and he gestured to the back of the store. However, when I went to look beyond the curtains in the back of the store, to my surprise, (and horror), instead of seeing anti-freeze, I saw about 15 to 20 white men sitting in folded chairs with their backs to me, looking at a recorded VCR TV message of a man dressed in KKK regalia, doing a teaching on white supremacy! Astonished, and frightened, I swiftly and quietly left before I was noticed. I was shaken and frightened, because my truck was broke down and I was stuck! Of course, lots of horrific thoughts and scenarios were rolling around in my mind. Thankfully, my vehicle was being worked on just down the hill. I stayed there the entire time until mechanics finished. I left Ruston as fast as I could before nightfall, and vowed I’d never go back. A few years later, when I became serious about my relationship with Christ, I remembered Ruston, and prayed for the city often, that God would raise up a church there that was multicultural, and carry revival in the region, etc. Little did I know, 29 years later, I would get the opportunity to return to Ruston, but this time to minister. When my friend and colleague Chris Estrada at CFNI shared with me that he suggested to a pastor in Louisiana that I speak in a conference with him, and told me to be expecting their call, I thought he was referring to a city like Shreveport or Lafayette. 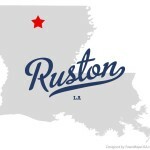 But when I found out it was Ruston, I was blown away. It was my first time back to Ruston since around 1986. When I got back to Ruston, I shared my story with Pastor Dallas Witt, and asked him to drive me to a spot that I thought was the gas station. Tears welled up in my eyes, and honestly, I didn’t know why. Maybe it was the anger of feeling afraid back then? Maybe it was the grief I felt over seeing men listening to a teaching, that was meant to block my forward progress simply because of my skin color? Maybe it was the grief the Holy Spirit felt about the hate that was released from this place? Perhaps it was all three “Maybes” I just mentioned. All I knew was that I tapped into something spiritually and emotionally, as if the pause button was taken off of that time of my life. I prayed the next morning, and I went to another location, and found the exact gas station. I went inside, and talked with an older black man, who said he had been in the town for 40 years, and knew the history of the gas station and its previous owners in the 80’s. After I shared my story, he validated my hunch and assured me that this station was the same spot I was at in 1986. He said that many didn’t know it, but the owner in the 80’s was involved in Klan activity, but few knew it. Later on, one of the speakers, Bobby Connor and his assistant, validated the story in a profound way. Before I shared my story, I spoke with Bobby’s assistant, and he said, “You know, we were blown away by this church, because it has so much love and racial unity. We thought it was odd, because when we got to the hill where our hotel is, we felt this KKK spirit over this region.” What he didn’t know, is that the gas station where I had my chance encounter with Klan members, was across the street from our hotel! More importantly, God used their discernment to confirm the direction he wanted me to go in, during the altar call and ministry time. That night, I shared the story of the kettle my Christian forefathers secretly used to pray under for freedom, and I also shared the amazing connection that Matt Lockett and I discovered about his family owning our family. (You can read more about that story here). After sharing about the power of God being released to heal the past and shape the future through prayer and reconciliation, the Lord had me to do an altar call. I called up people who were former KKK members, or anyone who knew their forefathers were KKK members, and wanted to have the generational curse connected to this broken off of their life. I thought only one or maybe 2 people would come forward, but to my surprise, about 30 or 40 people came forward. As they came forward to repent of their sins and the sins of their forefathers, I knelt before them, and forgave them and their forefather’s sins of racism, hatred, bigotry, etc, and began to break the power of generational curses off their descendants. Chris and Erica Estrada joined us and prayed, as we called forth generational blessings and spiritual inheritances to be released. After humbling ourselves and contending for healing in regards to the race issues in America, it led to a powerful time of praying for revival for our nation. Later that night, an elderly woman came to my wife Dehavilland for prayer regarding chronic back pain. As my wife and others prayed for her, she began to cry and exclaim, “I don’t feel any pain!” as she moved up and down like a 20 year old! She said, “You don’t understand, I don’t know what its like, not to experience pain! I’m healed!” We were blown away at God’s goodness. 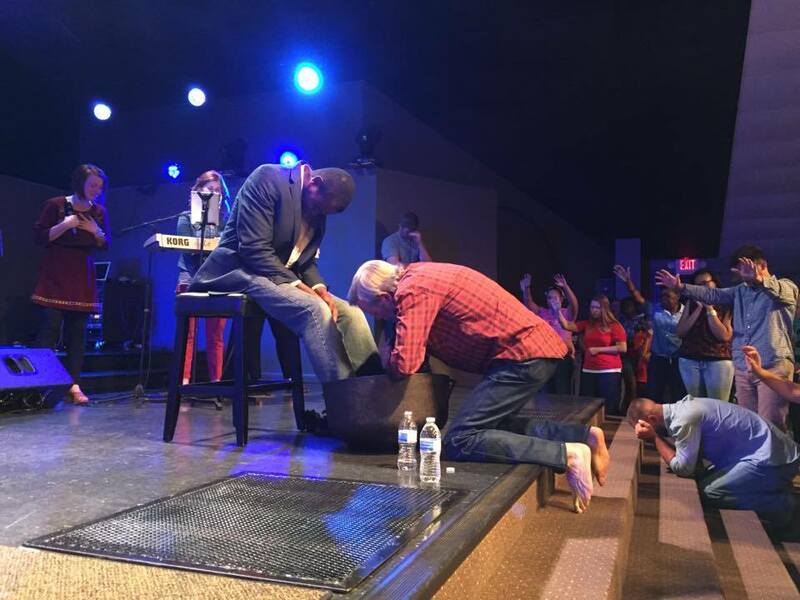 At the end, I asked the founding pastor, Chris Witt to have a seat on stage, and I did something I’ve only done a few times in 20 years: I washed this white pastor’s feet, in the 200 year kettle that muffled the prayers of my Christian forefathers for freedom. 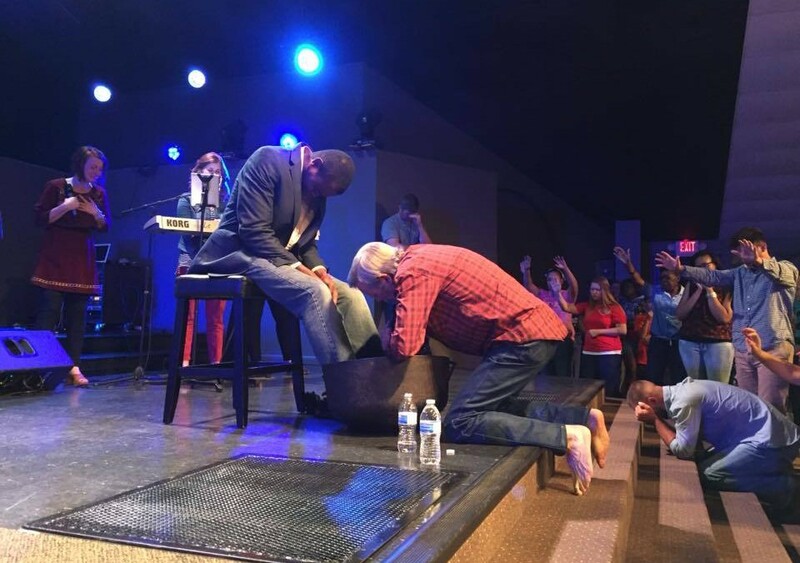 I washed his feet, and washed off the negative words of pastors that have spoken negatively of him for having African Americans in his church. He then surprised me, and then washed my feet, and washed away the pain and stain of my first visit to Ruston. It truly was an amazing night, to say the least. Amazingly, when I began praying for Ruston 29 years ago, I had no idea God was answering my prayers through this church, South Parkway Church, which is 40% African American, and 60% White with Hispanics and other races as well, all founded and pastured by this amazing Pastor Chris Witt and his son Dallas Witt. Our family spent 4 days in Ruston, and it felt like visiting family. Isn’t God’s plan of redemption astounding and glorious.?! Sean Smith says, “We’ve seen enough of pain in the headlines; it’s time for the church to restore our nation by getting on the frontlines!” and he’s right. God has a remedy for the racial division and pain in America: The Cross. I honestly believe that the elderly woman that was healed is a sign of the old wounds that can be healed through the Body of Christ when we come together. This is only a start, but it was a powerful way of moving forward. We definitely expect lasting fruit to come. Ruston Louisiana will never be the same, and neither will I.
WOW this is the culture of HONOR and what the language of Heaven looks like!!!!! What a great story. I am from Rayville,Louisiana and came to Christ in 1972. Rayville is about 50 miles from Ruston. I would like to visit the fellowship where they pastor. God is raising up prayer warriors who are binding the strongman and releasing God’s power. When I came to Christ I used to frequent African-American fellowships. It was a great time. I was born and raised in Memphis. I was there when Martin Luther King was killed there. I saw the prejudice. I had to fight the hatred that wanted my heart. I left there because of the hatred! Thank you for this testimony! I want to see the end of the division of the Body of Christ and prejudice is part of that division. God bless you and the work of your hands (Psalm 90:16-17). Awesome and inspiring story! Praying for God’s healing and restoration in America!!! Would it be ok for me to share this article? Powerful! I have heard you minister 2 times so far about your family’s wash pot history,but I think if it were a 100 times I would not be bored. We heard a true history lesson and a message of forgiveness, restoration, hope, and love. Thank you my brother.